RORC Commodore Michael Boyd sailing Quokka, one of the victorius Irish Commodores Cup Team in 2014. Picture Robert Bateman. 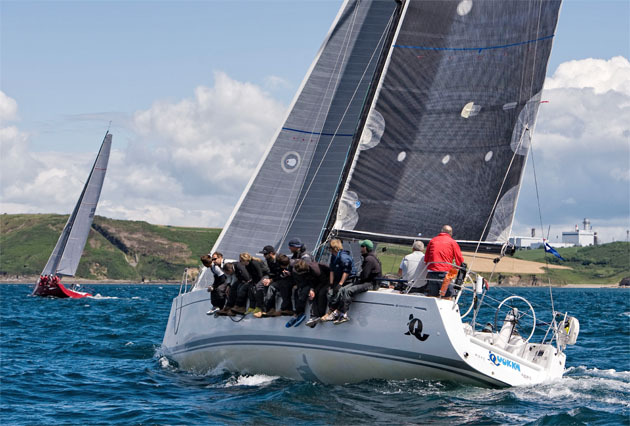 The introduction of a new ‘small boat class’ for the Commodores Cup is already generating a considerable amount of interest and ICRA is pleased to advise that they have already received enquiries from a number of very competitive boats wishing to represent Ireland. attract a lot of new Countries to the event. where 50% of the crew would be youth/under 25 sailors. This is an ideal event for Back Up Teams looking to get International experience and prepare for the 2016 event without the pressure of being in the Main Teams. They will experience the highest level of IRC racing Inshore and Offshore and learn exactly what is required of them to be successful at this hugely competitive and prestigious event and in particular to be mixing it with the current defending Champions. See www.cruiserracing.ie for contact data.